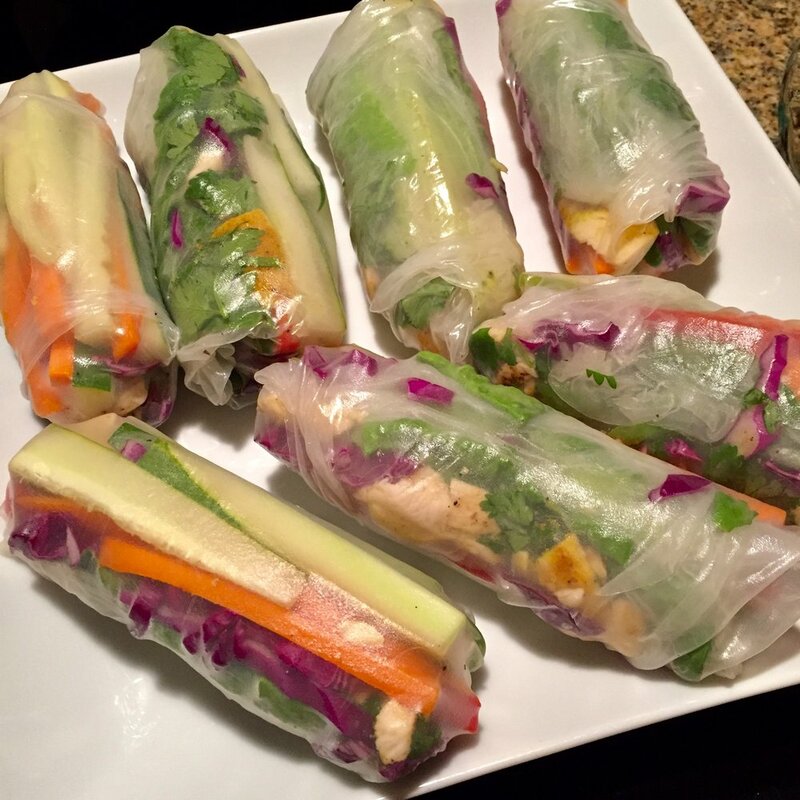 These very very good, but not the easiest to roll if it's your first time like me :) The hardest and most time-consuming part is the chopping of vegetables and rolling carefully, but overall, it's not a difficult recipe. The peanut sauce is a must!! It gives the wraps so much flavor. I mean... you can't go wrong with peanut butter amiright?? Make sure all your veggies and chicken are chopped before assembling the rolls. You can do this way ahead of time if you'd like, along with making the sauce. Prepare dipping sauce: In a small bowl, whisk sauce ingredients together (except water and optional garnish) and whisk until smooth. Add 1-2 Tablespoons of warm water or until you reach desired thinness. Pour into a serving bowl and top with garnish. Set aside. Watch this 45 second video on rolling spring rolls. Prepare rice paper wrappers: Pour warm water into a 9-inch square or round baking pan (or large bowl). Working with one wrap at a time, dip the rice paper wrapper into the warm water for 15-20 seconds (want a soft, but still slightly firm and pliable wrapper). Quickly remove from the water and place flat onto a work surface such as a large plastic or ceramic cutting board. Pat the wrapper slightly dry. Fill the rolls: Place a few sticks of carrot, cucumber, red pepper, and a sprinkle of cabbage on top of the bottom 1/3 of the rice paper as explained in the video I linked above. Add a slice or two of avocado, sprinkle of cilantro, and chicken chunks. Lay 1/2 of a lettuce leaf on top. Do not overstuff the roll or else it will break. Start small then add more if necessary once you get the hang of it. Roll them: Roll everything up tightly as seen in the video. Gently pull up the bottom of the roll and roll over the filling. Then, roll and use your hands to tuck the filling in as you go. Think of it as a mini burrito. Remember, you want to try to make a very tight roll so the filling doesn't fall out when you bite into it. Place the spring rolls on a serving plate. Cut in half, sprinkle with sesame seeds, and serve with peanut sauce. These spring rolls are best eaten right away or else they can get gummy in the fridge if you save them for the next day.